Rich smoky flavor in a crunchy, sweet, portable treat. Is it seriously possible? Yes, my friend, it is and it’s glorious! 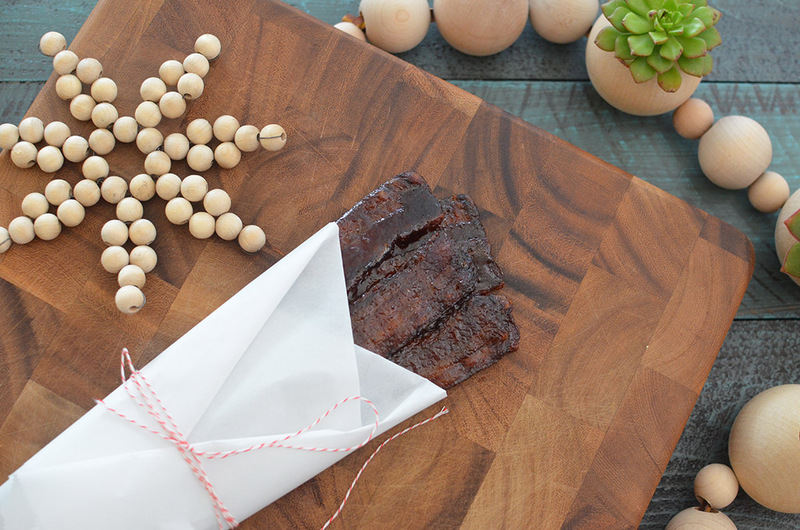 It’s easy to make, makes your house smell great, and people love to receive it as gifts. There are only 3 ingredients to make this and about 30 minutes cooking time. You’ll need to let the bacon sit for a bit to harden up, but it’s well worth it. 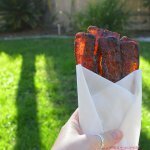 I sampled some “rib candy” when I was visiting my sister in Alabama. It was pretty delicious, but I knew it was covered in multiple types of sugars. I wanted to recreate a similar flavor that didn’t have the processed sugar or the long hours smoking meats. A friend mentioned candied bacon and I thought, genius! The smoking had already been done for you and as long as I was careful on which brand/type of bacon I selected, I could control the sugars that went into it. Here are the steps to make this delicious treat! Start with a lovely bacon and real maple syrup. 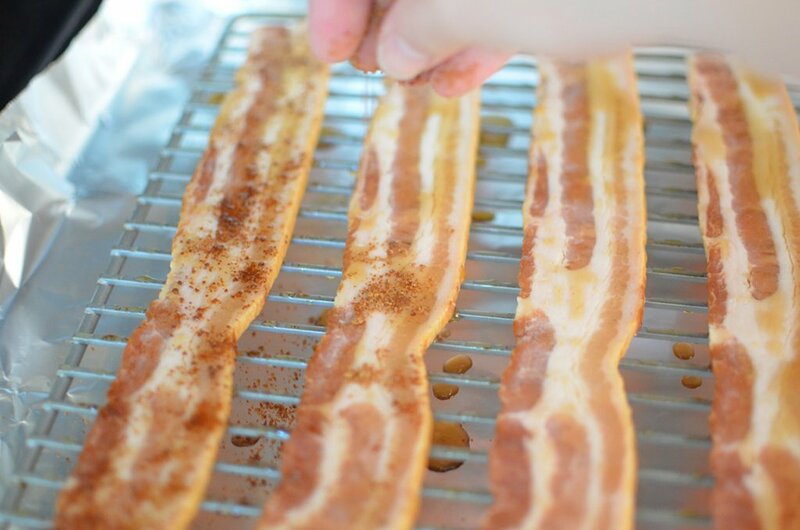 You’re going to put the bacon on a baking rack and coat it with maple syrup. Take your coconut sugar and liberally sprinkle it on top the maple syrup. Stick it in a 400 degree oven and bake for 15 minutes. Flip over the bacon and coat that side with maple syrup and coconut sugar. Bake for another 15 minutes. Remove the bacon from the oven and let cool. 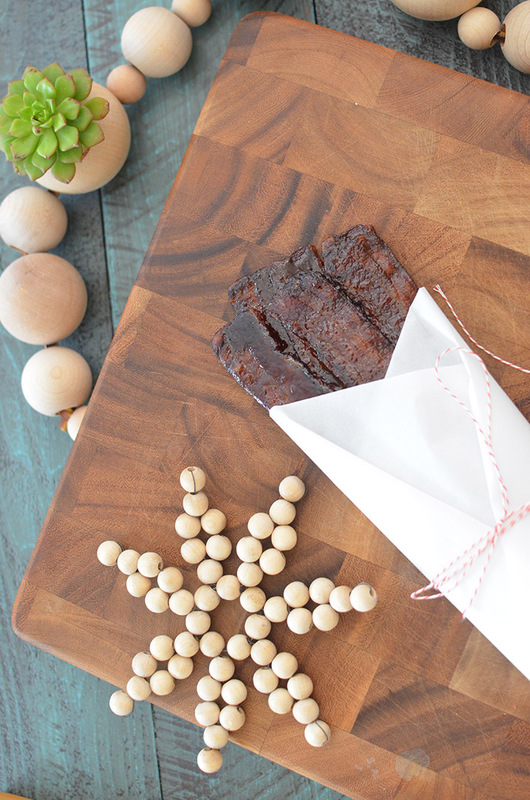 The bacon will harden a bit and can be refrigerated and given as gifts–though I can’t promise you it will last that long! Onto the paleo candied bacon recipe! 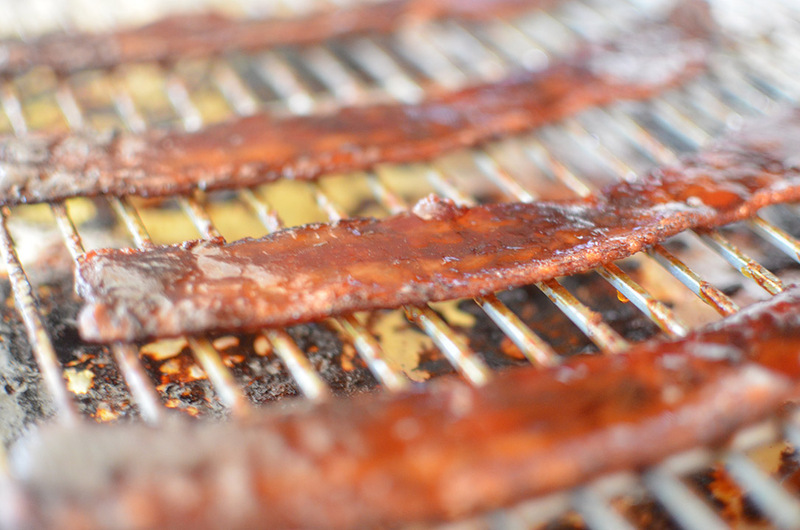 Crispy, sticky candied bacon that’s paleo and refined sugar-free! Cover a baking sheet with foil and place a baking rack on top. Line the bacon on the baking rack and with a brush, coat one side of the bacon with maple syrup. Once your bacon has been brushed with maple syrup, sprinkle coconut sugar over each piece of bacon. Turn the bacon around and repeat the maple syrup and coconut sugar steps. You will most likely have a small bit of coconut sugar left over. Bake for another 15 minutes, remove from the oven and let sit until bacon has cooled and hardened. 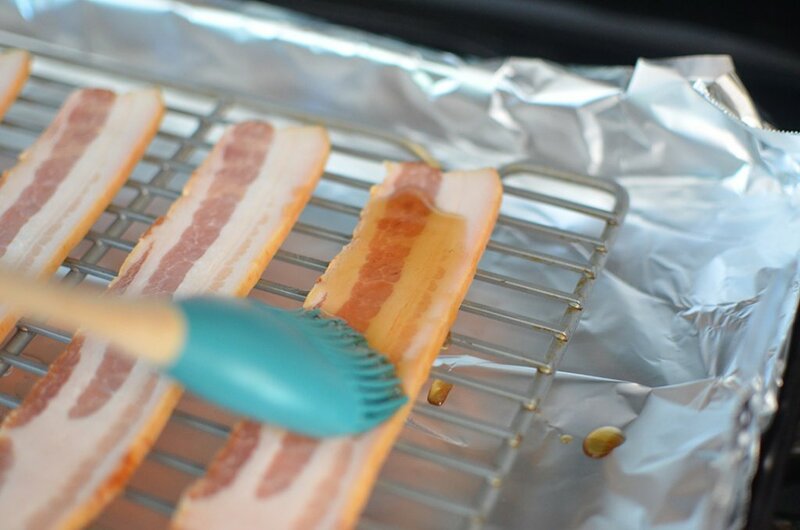 Bacon can be eaten once done or can be placed in the refrigerator wrapped in foil for storage.